Preeeeeeesenting…the Clown, and his Masters of Menace! Liz Allan, Flash Thompson, Betty Brant, J. Jonah Jameson, Aunt May (one panel only) + Mrs Van Der Twilliger and a chorus of police, doctors, schoolkids and art-lovers. The splash page is purely symbolic (we never see the Masters of Menace in a circus ring, and Spider-Man certainly doesn’t see the Ringmaster walking out on them.) The cover is more or less an enlargement of the first panel of the first page. In Duel With Daredevil the Circus of Crime appeared to consist of Samson, a strong man; two trapeze artists (unnamed) and a human cannonball (also unnamed). There are also figures on stilts, a figure in an “Arabian nights” costume, a bald uni-cyclist, and at least two clowns. (When the Ringmaster first appeared in Hulk #3, he had a clown, a cave-man, a midget human cannonball, and a grotesque with a long neck working for him.) The Clown and Princess Python appear here for the first time: but in a classic piece of Stan Lee "backfilling" everyone takes it for granted that they were in the team which Spider-Man defeated a few issues back. p2 “With my little gizmo secretly stuck to his fedora…” Obviously, the Ringmaster wears a top hat, not a fedora. It isn’t immediately clear why Parker gets this wrong. It’s an incredibly weak joke. p9 “Those crummy rat finks! I got them all together! Taught them all they know!” It is a good thing the Ringmaster literally recites his soliloquies out loud, so people hanging by the window can find out what is going on. p9 “He’s probably…using my old hideout…the warehouse where we stores all our circus equipment….on west 22nd Street.” West 22nd Street is between Grenwich Village and Times Square, in the Chelsea theater district, a by-no-means unlikely place to be storing circus gear. p11 “Boy! Didn’t any of you ever hear of the Good Neighbor Policy” The Good Neighbor Policy refers primarily to Roosevelt’s foreign policy towards South America in the 1930s. Again, this joke makes much more sense if Stan Lee, rather than Peter Parker, is making it. p17 “Before they can take it on the lam…” i.e before they can run away with the loot. Peter Parker’s financial situation: Peter sells pictures to the Bugle for the first time since issue #19. Jameson says the pictures of the Circus of Crime being arrested are “wizard” and “front page stuff” so Peter probably takes $2,000, leaving $4,000 in the cookie jar. I think Spider-Man fans may want to shout at me this month; because having been quite rude about the generally well-regarded Scorpion story, I am going to give a cautious thumbs up to the frequently overlooked second appearance of the Circus of Crime. It's a heist story -- specifically, a thieves-fall-out tale. A number of plot lines lead our hero on a moderately merry dance. 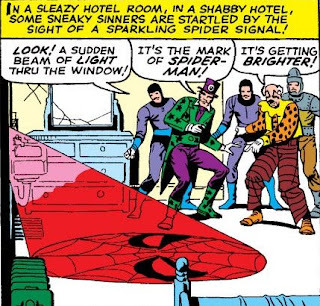 The Circus of Crime are out of jail (after 6 months); Spider-Man tracks them down to their hotel room and intimidates them with his Spider-signal. (Unusually for Ditko, the cover is simply an embiggerment of the first frame of the story.) During the confrontation, he cleverly slips a spider-tracer into the band of the Ringmaster’s hypnotic hat. But after he has gone, the circus troupe turn against the Ringmaster, who has after all landed them in prison twice before, and kick him out of the band. The team, now led by the Clown, decide to rob an art gallery as their first solo gig. The Clown distracts everyone with his juggling unicycle act, while the rest of the gang make off with the paintings. But wouldn't you know it! The art exhibition they chose to rob is the one being sponsored by J. Jonah Jameson and the Daily Bugle -- they end up putting J.J.J. in hospital. 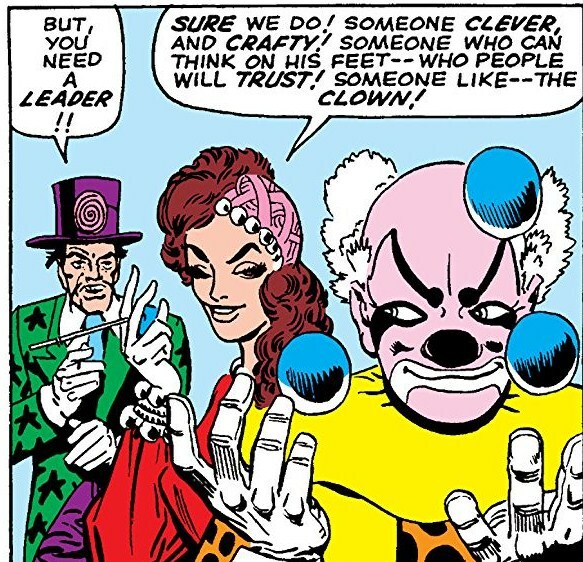 The Clown doesn't do a great deal in the story -- Princess Python is the central baddie -- but he is a splendidly sinister Ditko creation, all painted on sad face and frown, who idly juggles and unicycles while planning daring crimes. Of course, when Spider-Man tries to track them down, his spider-tracer leads him to the hide-out of the Ringmaster, who is no longer part of the band. But Spider-Man hypnotizes the Ringmaster with his own hat and finds out where the gang is hiding out. Princess Python offers to turn the other members of the gang over to the police, and share the loot with Spider-Man. The Clown, realizing he’s going to be double-crossed, takes the paintings himself and makes off with them; only to intercepted by the Ringmaster, who decides he's going to have the artwork -- but he in turn has been trailed by the police. 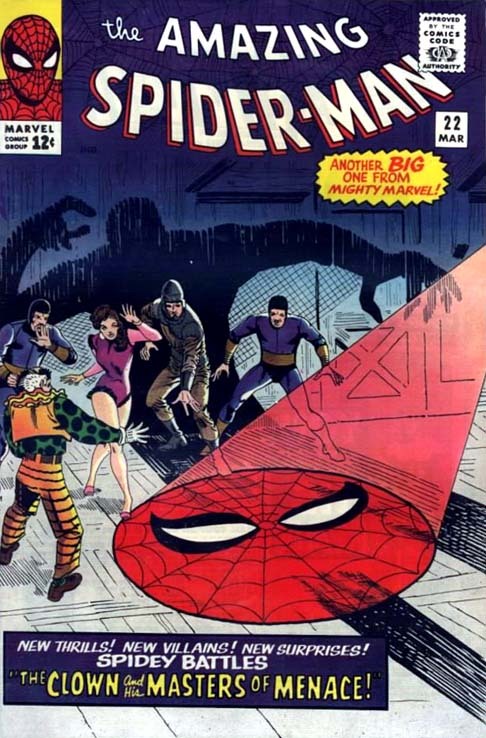 The story is structured as a sequence of two to three pages scenes, only a minority of which involve fighting: the robbery (page 5-7); Spidey tracks down the Ringmaster (page 7-9); Spidey fights the Clown, Cannonball and the acrobats (pages 11 - 13 and 15); Princess Python tries to seduce Spidey (page 16 - 17) ; Spidey's big fight with the python (page 18). This makes for a very pacy read. By Stan Lee’s criteria, there is little “action” in the comic — no single extended fight. But more happens on each page, both in terms of plot movement and in terms of physical action than in many a 12 page battle sequence. "Why don’t you and I team up? We could make beautiful music together!" "Sorry ma’am. I happen to be tone deaf." Spidey: "What can I do now? I can’t fight a female. I can’t use force against her…"
Princess: "My only chance is to take advantage of being female…"
Spidey: "I don’t want to have to get rough with a female…"
It's almost like Stan Lee himself feels uncomfortable with the idea of a lady baddie and keeps drawing attention to it. The very word "female" sounds clumsy, coming from someone who normally calls women "gals" or "chicks". (Note that at the beginning of the story, Betty admitted that she was a "foolish, jealous, female"). But the taboo against male on female fight scenes seems to have been taken out of all proportion. As far as it goes, it is sensible to bring up schoolboys — who, by hypothesis, fight each other all the time to establish status — to think that it is not manly to start a fight with a woman, or with a smaller man, or with anyone wearing glasses. And you wouldn’t stage man vs woman wrestling bouts or prize fights for the same reason you don't have mixed tennis tournaments — there is too much disparity in strength and stamina for the fight to be fair or interesting. But it seems that this playground honour code has been turned into an unbreakable moral principal. Is it really the case than a male can never hit a female? What does a male police officer do if a female criminal is resisting arrest? Don't male soldiers ever have to confront female warriors on the other side? What does a gentleman do if a lady hits him first? It will be a long time before Spider-Man has to confront this dilemma again: he doesn't have another female opponent until Medusa (#62) and the Black Widow (#86). There is a strong sense that this issue is trying to create a new, post-triptych format in which characters have comic foibles rather than personalities. When J.J.J threatens to fire Peter Parker (a freelancer) no-one even bother to pretend they think he means it. When he learns that Betty has kept a vigil by his hospital bed he exclaims “Too lazy to go to work, eh!” and Betty smiles ”He’s as nasty as ever — so I know he’s all right now!” The issue before last Jameson was paying masked supervillains to murder Spider-Man: now he is a Perry White style comic foil whose bark is worse than his bite. Similarly, Peter and Betty are repeatedly shown together during the art heist, giving the impression that they are now a couple in the way that Lois and Clark are. The final page, with Peter saying “Oh no! The painting have been recovered! We’ll have to look at them again!” and the three of them marching off together feels very much like the end of situation comedy. Which is far from being a criticism. If the Amazing Spider-Man is to continue as a monthly comic, it can't be in a state of permanent crisis: there needs to be a comfortable status quo which can be disrupted and reestablished each month. This is a perfectly adequate story, with tons of plot movement, some dead ends, and some minor twists. Lee and Ditko could carry on giving us this kind of thing almost indefinitely. But three issues on from The End of Spider-Man, and there is still no real sense of direction for the new, self-confident Peter Parker. The 'female' thing also pops up in X-Men, where neither the repressed Cyclops nor the erudite Beast seen to know how to politely refer to their peer Marvel Girl. It seems to be a Stan Lee tick. "Unusually for Ditko, the cover is simply an embiggerment of the first frame of the story." I believe the canonical spelling is "embiggenment".